We hear and read about geography every day: during the nightly news broadcast, while reading the newspaper, or when planning our daily commute. We need to understand something about geography to pass the pop quiz in our world history class or to use an online map service to print directions to the airport, the closest car mechanic, or our next vacation destination. But this little bit of understanding is only the beginning. To manage the geography of life (information and data about our world), we need tools that enable us to visualize and analyze that information. This is where the magic of GIS begins. GIS technology opens the door to a whole new way of thinking. It allows us to find patterns and relationships that help us make more informed decisions. This is the message our GIS Day heroes bring forth each year during the third week of November. They open the door (sometimes literally) to GIS for their colleagues, classmates, and constituents. GIS Day is November 14, 2007. No matter how small or large the event, we thank them for their dedication and support of the mission of GIS Day. Their invaluable contributions help spread GIS knowledge and awareness a bit more each year. Below you will find a few of their stories. More stories await your exploration at www.gisday.com. Team GIS Day reaches Bucegi Plateau (2,209 meters), the pinnacle of their GIS Day mapping expedition project into the spectacular Bucegi Mountains and Bucegi Natural Park areas. 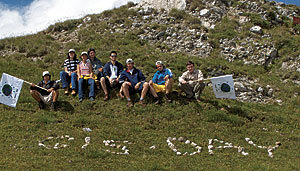 Cheveresan Bogdan, technical support analyst from Esri Romania S.R.L., began celebrating GIS Day early in 2006 by leading a group of high school students on a five-day expedition. Equipped with GPS units, cameras, and true GIS Day spirit, the 10 students began their hike between Luminis Mansion, home of famous Romanian violinist, conductor, and teacher George Enescu (18811955), and the Bucegi Mountains. The Luminis Mansion, located in Cumpatu, Sinaia, was George Enescu's single property and played a special role in his life. His wish, in 1946 when he donated the mansion to the Romanian state, was to transform the estate into a settlement for artists to use as a refuge. Surrounded by nature and beautiful landscapes, the composer likened the estate to a silent oasis where he could fulfill his dreams and compose his greatest works. Despite the region's immense beauty, the students felt it was somewhat a hidden secret with tremendous untapped tourism potential. Their hope was to create a tourism brochure that would give the area the honor and exposure it deserved. Prior to their journey, the students used ArcGIS to analyze the most accessible travel routes for their hike. They then set out on their expedition with the plan of documenting their "actual" travel pattern by taking GPS coordinates along the way. Through Cabana Poiana Izvoarelor (1,580 m), Cabana Malaiesti (1,720 m), and Omu (2,505 m), they diligently recorded each GPS point along their course until reaching their final destination, the Bucegi Plateau at an elevation of 2,209 meters. Here they found themselves in the company of the spectacular Babele ancient rock formations (the old ladies) and the Sphinx, which were carved out by wind and rain. Although the downhill trek rewarded the students with picturesque views of green valleys, steep gorges, and wildflowers, their expedition was far from over. 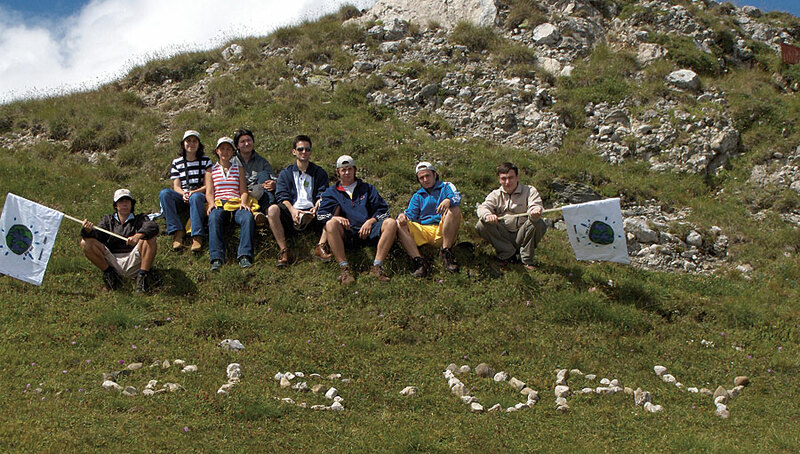 The students returned to their GIS classroom and used ArcView with the ArcGIS 3D Analyst extension to transform all the points and pictures they collected into an engaging sightseeing brochure to promote the spectacular Bucegi Mountains and Bucegi Natural Parc areas. The flyers, brochures, and Web site they created were then presented to a group of students and teachers in Bucharest later in November on GIS Day. Proud of the students' accomplishments, mentor and teacher Bogdan remarked on their project's success saying, "If you are planning to visit one of these locations next year, you'd better start bookingwho knows, it might get crowded." This was not the students' first endeavor in the tourism business. In 2005, they worked on a similar project creating a brochure to promote one of Romania's most well-known castles, made famous by the Jules Verne novel The Castle of the Carpathians. The Delaware County Auditor's Delaware Appraisal Land Information System (DALIS) Project celebrated GIS Day for the eighth consecutive year. On Monday, November 13, 2006, more than 400 students attended presentations and a Map Gallery at Dempsey Middle School in the city of Delaware, bringing the total number of students who have attended the project's GIS Day celebrations over the past eight years to more than 2,600 students! The 2006 celebration was even bigger than usual, as the project was joined by the Delaware County General Health District and the Delaware County Soil and Water Conservation District. The Northern California Chapter of the Urban and Regional Information Systems Association (NorCal URISA) along with the City of West Sacramento partnered to celebrate GIS Day in November at the West Sacramento Civic Center. The event, which included a wide variety of participants encompassing professionals from federal, state, and local governments as well as environmental consulting firms, GIS equipment vendors, and local GIS educators, treated its guests to a special hosted lunch and a GIS Day cake for dessert. Visiting the transportable Topcon Satellite Theatre was the highlight for many attendees, as GIS moviegoers interested in positioning technologies were able to view a movie on the inside of a 360-degree planetarium dome. The movie, titled Celestial ConnectionsGuiding GIS Solutions, was a fictional characterization based on a real-life story of a GIS professional attempting to collect GPS position data, attributes, and digital photographs who experiences frustration dealing with multiple pieces of hardware, as well as buildings and tree canopy that block the GPS signals. The movie showed viewers how spatial technologies could be used to overcome these obstacles to achieve project success. "Going to the Topcon Satellite Theatre as part of our GIS Day really made the event special," says Anthony Arieas, City of West Sacramento GIS specialist and GIS Day event organizer. "GIS is not just about making maps; it is also about data and data collection. The theater gave our attendees the chance to have fun learning about GPS in GIShow it works, how satellites workand they were able to walk away with a better grasp of what GIS really is." 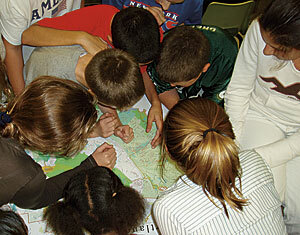 Seventh graders at Hendrick Hudson High School in Montrose, New York, study a county map during the GIS Day event organized by high school senior, Dietrich Knauner. In the midst of the mad dash to submit college applications in fall 2006, Dietrich Knauner, a senior at Hendrick Hudson High School in Montrose, New York, figured adding one more thing to his busy to-do list would not be a problem. Inspired by a Pennsylvania State University open house he attended earlier in the year, Knauner not only decided that he wanted to major in geography/GIS in college, but he also decided to plan a GIS Day 2006 event for his school to help make other students aware of the amazing technology that he had discovered. Knauner began tackling his objective by contacting his county's GIS Department to gather ideas on what to present to the students. In an interesting twist of fate, the department's chief information officer, Dr. Norman Jacknis, turned out to be a resident in Knauner's school district and his daughter was a junior at the same high school. Jacknis put Knauner in touch with additional staff at the county who decided to join Knauner's effort. Knauner's second event-planning step found him meeting with the social studies and science teachers in the district. He reached out specifically to his former seventh grade science teacher, Sean Bugara, who was also his Boy Scout and Eagle Scout sponsor. Despite his busy schedule and not knowing quite what to expect, Bugara agreed to have Knauner come into his classes to celebrate GIS Day. On November 16, Knauner gave his GIS Day presentation to five of Bugara's classes, a total of approximately 120 students. To introduce the students to Geography Awareness Week and GIS, Knauner first gave a PowerPoint presentation tailored to natural science applications of GIS, such as tracking annual precipitation in New York state, tracking avalanches, and conducting an in-depth sea turtle study in Bermuda. He talked to the students about the way GIS enables people to study and analyze almost anything that can be put on a map, whether related to science or social studies. County GIS specialists Cynthia Louie and Ilir Toto gave the second part of the presentation explaining the numerous maps they had created specifically for the event. Of particular interest to the students were the aerial blowups of the schools in the district, especially the map of their own school grounds. They explained the maps they brought, including a map of the county's hurricane study, an open-space study, and a study indicating where gas prices were the cheapest in the county. T-shirts and inflatable globes added to the fun as well as a GIS Day cake that Knauner's mom had made. As the students left the class, they were given several foil-covered chocolate globes. All of these special touches helped make learning about GIS fun. By the end of the day, some of the other middle school teachers and the school's principal had stopped by to see what all the GIS excitement was about! "All of Dietrich's talents and strengths came together during his GIS Day presentation," praises one of his teachers in a college recommendation letter. "I saw him emerge as an inspirational leader, using his skills to plan, create, and carry out the project to a wonderful end product."